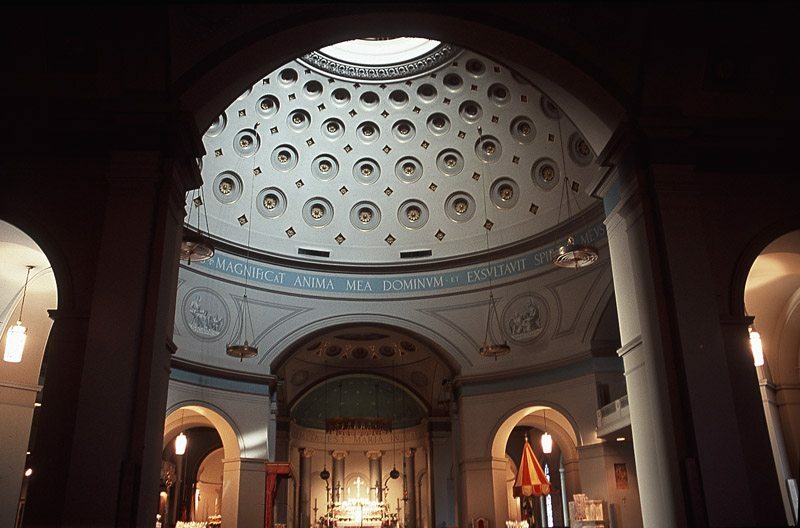 It's been announced from the premier see that the Basilica of the Assumption at Baltimore, the mother church of US Catholicism, will be reopened on 4 November. A wonder of Benjamin Latrobe, who also designed the Capitol building in Washington, the Basilica -- which has been closed for 15 months for a comprehensive $32 million restoration -- will be rededicated the following day by Cardinal William Keeler, the 14th archbishop of Baltimore. A week of festities will ensue, closing with the opening liturgy of the US Conference of Catholic Bishops' November Meeting (to be held in Baltimore this year) on the 12th. Four touches not envisioned by Latrobe will be part of the finished interior. Fresco paintings dating from 1865, representations of Matthew, Mark, Luke and John that were walled up in the late 19th century and not rediscovered until last summer, will again be revealed. New paintings that depict the Assumption of Mary and the Ascension of Jesus in the style of the early 19th century have been installed in the saucer domes that flank the great dome. From the beginning, light illuminates the biblical narrative. As an image and a symbol, it signals the presence of God, throughout the world and within man. And so it would be that yesterday, the interior of the nearly restored Basilica of the Assumption was aglow with sunlight, the old cathedral's new linen-white palette reflecting the simplicity of Benjamin Henry Latrobe's neoclassic design. The intent of the $32 million renovation was to restore the nation's first Roman Catholic cathedral to its 19th-century origins, and it mostly reflects that vision. It relies on diffused light, an effect known in Latrobe's time as lumiere mysterieuse (mysterious light). Could there be any more appropriate metaphor for a symbol of religious freedom? Marylanders should care about this building for several reasons. The basilica, completed in 1821, is one of the most important architectural landmarks in the country. Latrobe designed it at the request of John Carroll, the nation's first bishop. For American Catholics, it's their St. Peter's. But people of all faiths should appreciate the basilica because it represents the role religious freedom played in the state's founding. I can't wait to be there for it. More info from the Basilica Historical Trust here.